The largest wine area in New Zealand (producing, in fact, more than half of New Zealand's wine), Marlborough is the home to New Zealand's most famous wine, made from the sauvignon blanc grape. Take a car and spend a few days visiting some of Marlborough's wineries. Most have wines available for tasting and a number also have their own restaurant or cafe, where you can enjoy the wine alongside great food. The golden sand beaches that fringe this park are the finest in the South Island and are just one of the features of this lovely corner of the country. Situated near the north-west corner of the South Island, and less than an hour and a half's drive from Nelson, this is New Zealand's smallest national park. Amongst the many hiking trails is a 53-kilometer coastal walk that ranks as one of the best in New Zealand. The stunning backdrop of Kaikoura is the snow-capped mountain range which seems to come all the way down to the sea. Amongst the many activities here—fishing, hiking, kayaking and even bird watching—the one not to miss is a boat trip on the bay to see the whales. Kaikoura is, in fact, one of the best places in the world for whale watching. An hour and a half north of Christchurch is one of New Zealand's most visited tourist attractions, the thermal pools in Hanmer Springs. Hanmer Springs is a pretty alpine town that offers skiing in the winter and hiking in the summer. At any time of the year, though, enjoy the hot pools. There are a variety of different sizes and temperatures, including private pools, and world-class spa treatments are also available. The alpine setting of Hanmer Springs is second to none. In Westland, on the South Island's remote west coast, these are two of the most accessible glaciers in the world and also amongst the lowest at only 300 meters above sea level. A unique feature is the backdrop of lush rainforest which presents an awe-inspiring sight. On any list of places to visit in New Zealand, Queenstown should be at the top. This alpine resort town has things to do for all seasons and breathtaking scenery that is amongst the country's very finest. Situated on the shores of Lake Whakatipu, there is a full range of water as well as land-based activities. In the winter Queenstown is the place for the best skiing in New Zealand. Some of New Zealand's best restaurants are in Queenstown and don't forget to sample the region's wines; pinot noir and chardonnay, in particular, are very high in quality. 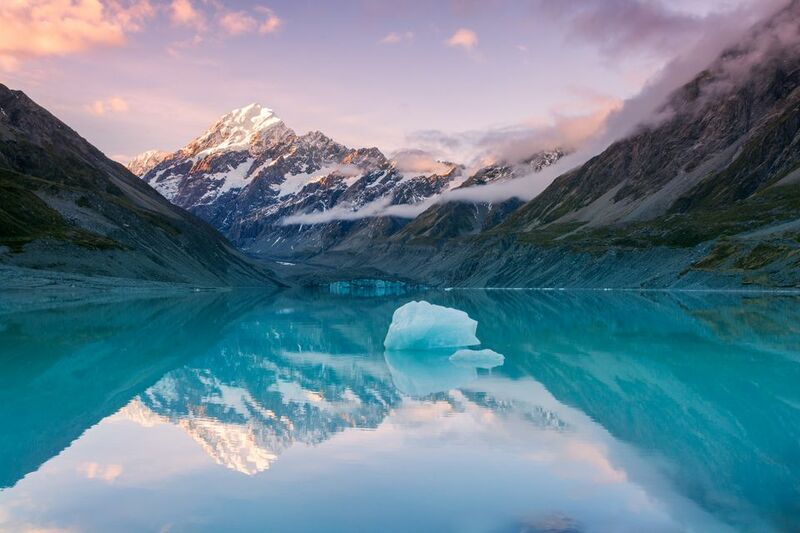 This park is home to the highest mountain in New Zealand, Aoraki Mount Cook (height 3754 meters), and numerous others which make up the highest peaks within the Southern Alps. In the summer, hike for a few hours or days on one of the many trails, or go fishing or horse riding. In the winter it is possible to go skiing on New Zealand's longest glacier, the Tasman. Mitre Peak is a mountain which seems to rise out of the waters of Milford Sound and is one of the most photographed and recognizable New Zealand sights. Milford Sound is one of the many 'sounds' (or fjords) in the Fiordland National Park, situated in the southwest corner of the South Island. The water is surrounded on either side by rock faces that rise at least 1200 meters (3,900 feet) and after rain (which is very frequent) hundreds of waterfalls appear, some up to a thousand meters long.